Pound for pound, not many North American fish in fresh water fight harder than the Common Carp. 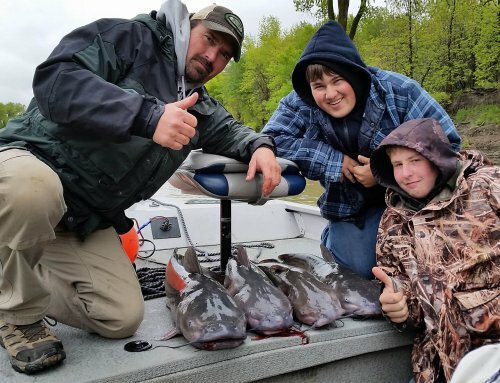 There is no question that many, if not most of our bodies of water in the state contain them and plenty of anglers have had their hardware tested by the brute fight of one of these fish. We think of them generally as an open water species to target but have you ever thought of tackling one through the ice? My first experience icing old bugle lips happened many years ago on a lake just outside of Fort Dodge. My buddy Matt and I were fishing for gills with waxies on a mud flat when he set the hook on something that meant business. Maybe a big bass we thought but either way he had a lot of trouble gaining any line back on the fish. After a big battle to our shock and dismay a nice fat carp came thrashing up through the hole. I love to fish for carp during the summer months but now I had a new quest, to try for carp on hard water. Carp during the winter months can be somewhat dormant just like other species at times but they also need to eat and will actively roam about just like schools of crappie or walleye feeding on what is available. I’m sure some of you with underwater cameras have observed carp moving through while scanning for other fish. Aquatic insects and larva are high on the menu and you will often find carp in the same areas as bluegill, crappie or bass, feeding on these resources. Warmer water in a system is always a plus to find active carp but be careful of the ice in these instances. Some of my favorite places to look for carp, especially when the snow cover is minimal, are muddy or dark bottom bays adjacent to a drop off or deep-water vegetation. These areas warm up faster during the day and attract carp looking to feed. Depths I like to start looking at range from five to eight feet deep. A flat that forms a point with drop offs on either side can be a key spot. Bays with a depression can also be really good. These locations are good starting points and have led me to success in the past without using high tech electronic gear. If you have an underwater camera this tool can be your best friend when trying to locate carp if the water clarity permits. When the camera is down and you see a fish or two roaming about then you have a big head start. Carp can sometimes be unpredictable in their locations under the ice and it isn’t always the mud flats or weed edges that hold them. The active fish will be where the food is. 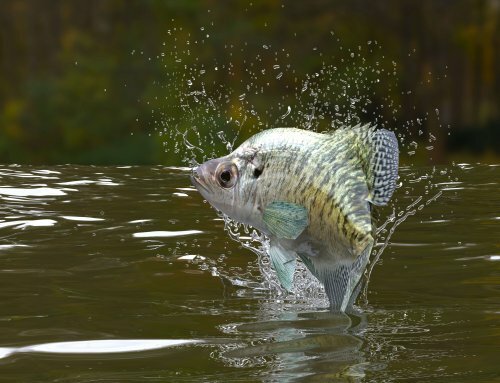 Carp can be caught on a multitude of baits, most of which are designed for panfish. Top performers include bloodworm imitations, nymphs and even just a bare hook loaded with waxies or spikes. When it comes to rod and line selection, be sure you are equipped to do battle with a bigger fish. I like to spool up with at least 6lb mono or 10 lb braid and then tie on a six to eight foot section of 10lb fluorocarbon for a leader, joining the two lines with a tiny barrel swivel. 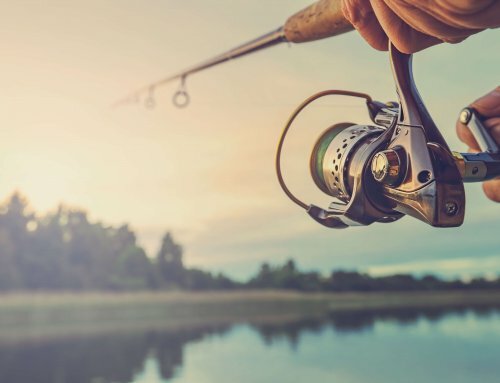 Carp have excellent eyesight and fluoro can help generate more bites due to its invisibility in water. But, if you simply want to rock the old panfish rod go right ahead. Just be ready for that equipment to be tested and don’t say I didn’t warn you. The tactics for carp are about as simple as it gets. Let a bait sit and wait for a bite. There are two ways to go about this and one would be to simply let a bait sit on the bottom. In this style of fishing, small dough baits, a hook loaded with waxies or a worm all work well. 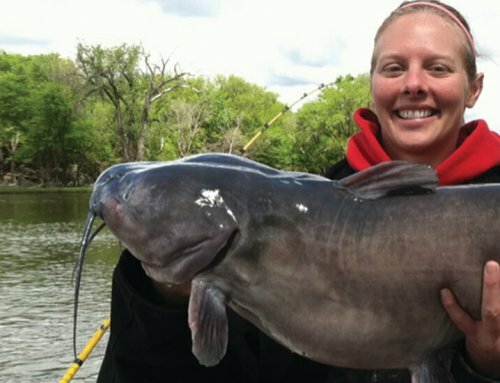 Use a small float to watch for bites and when the float falls on its side or slips under, set the hook. Carp have very sensitive mouths so if they feel any tension while picking up the bait they are liable to spit it out. The other tactic would be to suspend and offering a foot or so from the bottom. 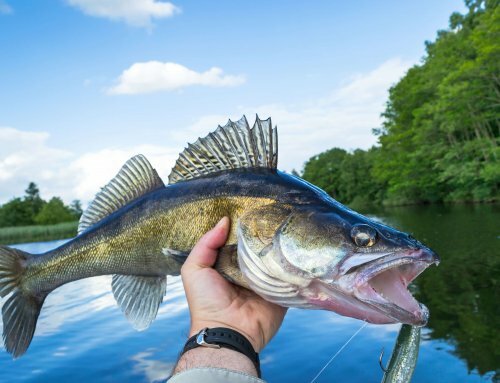 Using a small hook or jig tipped with waxies or spikes, let it sit beneath a small float and wait for the bite. Carp can be slow biters during the winter so it pays to watch for the slightest change in the float behavior to notice a strike. There is one other tactic that can sometimes produce and it really brings a sense of challenge and accomplishment when a carp is caught and that would be jigging with artificials. Tip the jig with live bait and be ever so slow on your presentation. Dropping the jig to the bottom to stir up some sediment and lightly jigging it up can imitate and emerging insect which carp most certainly key in on. Tip-up fishing for carp is a great way to target them while focusing on other species if desired. Be sure to have a fluoro or mono leader on the tip-up main line and set a dough bait, hook with waxies or spikes on the bottom or just off of the bottom. I really like to use a small circle hook in this instance because as soon as any tension is put on the fish they have a good chance of becoming hooked whether that tension is caused by the spool or from you picking it up after the flag tripped. Set the spool tension as light as possible because as mentioned before, if the carp feels any resistance they tend to drop a bait. You will see less dropped baits and more hooks-ups using circle hooks but it always pays to err on the side of caution. Sometimes using chum can be a great way to call carp into a area and get them feeding. This is a little harder to do on ice versus open water but if you have a means to drill a few extra holes, sprinkle some corn, small bits of dough or some spent waxies down the holes around the area you are fishing. Once carp start feeding they will generally roam around the area for a while unless a noise spooks them out. Just be sure not to put too much chum down and draw attention away from your baits. Carp can be easily spooked, even under the ice when their moods are more sluggish. After drilling holes, be patient, as it may take some time for things to calm down and the carp to feel comfortable enough to come back. If there is food in the area they WILL come back. Even use caution when walking about the ice and try to keep foot traffic to a minimum if possible. Now that we all have ice fishing on our minds it’s time to bust out the tackle and look forward to another hard water season. It may sound silly to fish for carp through the ice but I promise you, the fight is something you will not soon forget. Whether you try for them with rod and reel or let a tip-up marinade while fishing for other stuff, give carp a try if they happen to be present in the waters you fish. Have a great ice season!